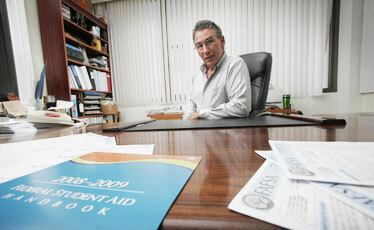 Frank Green, a board member and former president of the Pacific Financial Aid Association, says his organization's goal is to help as many people as possible without charging them for the information. Mike Young, career counselor at Kalani High School, hands out fliers to parents and students to warn them about college planning and financial aid scams, but it's an uphill battle. "It's a multimillion-dollar industry," he said. "They scare people into thinking that if they don't sign up, they're not going to get any financial aid. I had one case last year where the mother came and told me she had given them $1,000 and then she found out I do the same thing for free." Parents and students looking for reliable information on getting into and paying for college should start by talking to their high school counselors. Financial aid officers at local colleges and universities are also ready to help, regardless of whether you attend their school. That's the advice of the state's two professional associations in the field: the Hawaii Association for College Admissions Counseling and the Pacific Financial Aid Association, both nonprofits. "You can go to the community colleges, UH-Manoa, BYU-Hawaii, Chaminade and ask their financial aid representatives for assistance," said Asai Gilman, president of the admissions counseling association and assistant dean of admissions at Brigham Young University-Hawaii. "I don't think parents at the high school level recognize that." The federal government renamed its application form the "Free Application for Federal Student Aid" several years ago for a reason. "They put the word 'free' in it so that people knew you don't have to pay to get financial aid," said Frank Green, a board member and former president of the Pacific Financial Aid Association. "Part of our job in the financial aid office is to help as many people as we can and we don't charge for that." The Hawaii Association of College Admissions Counseling will team up with First Hawaiian Bank to offer free college planning nights starting next month that include information on testing, financial aid and course selection. Later this fall, the Pacific Financial Aid Association will sponsor nights focusing specifically on financial aid at high schools statewide at no charge. Parents of high school students are advised to start early and get to know the Free Application for Federal Student Aid, the uniform document that is required to apply for federal aid and most state and college aid. A government Web site, www.fafsa.ed.gov, offers information, worksheets and a toll-free number for questions. An easy calculator, the "FAFSA-4caster," on the site allows families to gauge their expected contribution toward college costs, based on their income and assets. The form shows families what assets are relevant in applying for college aid, and what are not. The federal formula doesn't count retirement accounts or life insurance, for example, in determining a family's expected contribution. The family home also doesn't figure into the formula, although the equity in a second, rental home does. Financial aid applications may be submitted as early as Jan. 1. Young said he tells parents to turn to professionals they trust when they ask him for advice on how to handle their finances to increase their chances of getting aid. "Their own financial adviser, their accountant, their tax man can give parents legitimate tips," he said. "We all know those are out there and that they are legal. The parents' own resources would be better than somebody they don't know or can't trust."